For many companies, discovering black discoloration on your wood packaging products can be troublesome. At first glance it might look like mold fungi but it might be something else entirely. Understanding the difference could save you time, money, and a great deal of worry. For example, there are types of fungi that grow on lumber called bluestain and they are not linked to human health concerns. Interestingly, there are also other types of naturally occurring defects in lumber that might look like mold but in fact are not biological. 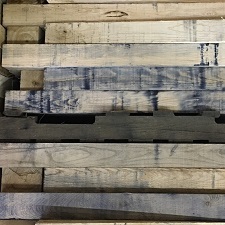 Before you “jump the gun” and ask your supplier to replace all your wood pallets, keep in mind there are many types of naturally occurring, non-biological defects that may look scary, but are not caused by microorganisms (fungi, bacteria, etc). Learn more about about the discolorations below. Iron stain is a common discoloration found on wood. Oak, redwood, cypress, and cedar are particularly prone to iron stain because these woods contain large amounts of tannin-like extractives. The discoloration is caused by a reaction between extractives naturally occurring in wood and iron-containing materials, such as metal fasteners and sawblades. Staining is spread by water movement, so the affected area is less for woods that have low moisture content, although staining can occur if water is reintroduced to the surface of the wood. The staining is cosmetic and does not affect the strength properties in wood. Brown stain or zebra stain may appear in western hemlock only after the wood is dried in a kiln. The unaffected areas appear light yellow, affected areas appear dark brown, making for noticeable differences in surface color variation. 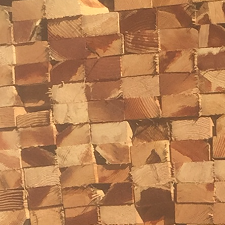 Below the surface of susceptible pieces, sometimes the brown stain will appear black after the wood is dried. This is known as zebra stain. Zebra stains happen when iron or manganese darkens the browning and makes it turn black. The impact of sun exposure causes a chemical change in the tannins of the wood that, over time, react to UV rays from the sun. If this happens to your wood packaging product, or other lumber product, it’s said to be “weathered.” This is common if your wood product is left outside and exposed to the sun. Over time, it will darken (like a sun tan) and may make the wood appear dirty or damaged. Bluestain is not mold; it is a common cause for the discoloration of lumber. Certain dark-colored microscopic fungi cause a bluish or grayish discoloration in the sapwood of the tree. Not all bluestains are blue. Other stain shades can be blue, bluish black, gray, brown, red, yellow, orange, or purple. Bluestain has no effect on the performance and strength of lumber. It can be used for exactly the same purpose as non-stained lumber. Bluestain poses no health risk, and is safe to handle. Typically seen in the forms of dark lines or streaks in oak, green or brown patches in sugar maple, or purple to black areas in yellow poplar; mineral discoloration sometimes develops in standing or fallen trees in mineral rich soils. Preventing discolorations caused from iron stain and weathering are quite manageable. If you store wood products outdoors, keep them covered yet ventilated to prevent weathering. "Identifying Wood Discolorations" - Download brochure: A full-color brochure is available for your customers and sales team. Download the high-res .PDF file for your printer. This page and corresponding handout is a project of the NWPCA Industry Marketing Committee. Published April, 2019. Please contact NWPCA if you have recommendations or comments on the information contained.